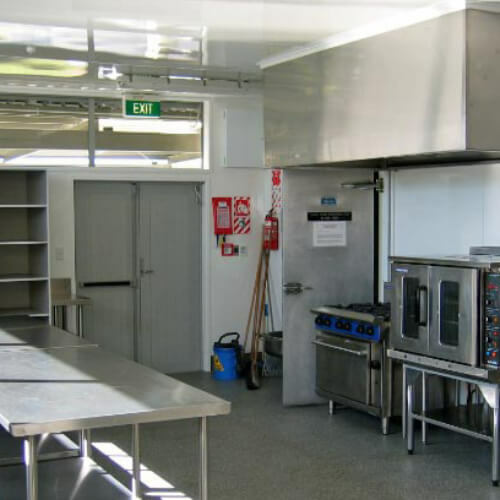 A commercially licensed kitchen, that comes with basic yet modern kitchen equipment including gas oven, separate gas stove, domestic stove/oven, microwave, walk in chiller, 2 wall mounted hot water urns, various fridges and a Starline dishwasher. The Kitchen also includes a Bar that opens to both the Banquet Room and Kitchen. Various, but again basic kitchen items are available upon request including a variety of crockery, cutlery, baking dishes and serving trays. Measures 13.5m long x 9m wide excl. the bar area. Hall measures 27m long x 17.5m wide and 5.3m high. Stage measures 11.5m wide x 4.4m to the back wall (excl. stage extension) and is 4.3m high to the ceiling.